“UFC on FOX” co-stars two of the game’s most creative smack talkers, but things have been eerily quiet between Michael Bisping (Pictured) and Chael Sonnen heading into Saturday’s shootout. Although there’s only four days remaining until showtime, Bisping is fully prepared to engage in verbal warfare on a minute’s notice. “If he tries to get under my skin, I will take the bait,” Bisping wrote in his blog for The Telegraph. “If he starts talking and saying things, as he often does, I will retaliate. Bisping’s desire to exchange insults isn’t as much about knocking Sonnen off his game – if anything, getting Uncle Chael going could prove to be an embarrassing predicament for the Brit – as it is about giving himself the extra boost needed to get his hand raised. 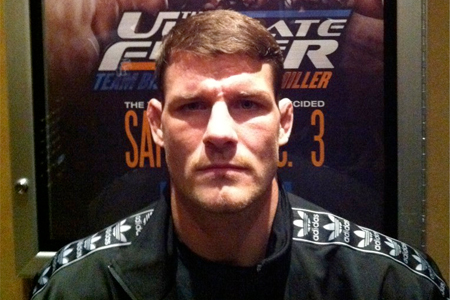 “I fight a lot better when I’m irritated by my opponent,” Bisping admitted. “I fight a lot better when I’m emotional. When I feel the fight has become personal, I feel I do perform better. People say that you get thrown off your game plan, but I don’t react that way. The 185-pounders will have one final opportunity to exchange pleasantries face-to-face during Thursday’s pre-fight press conference. Knowing Bisping wants to take things to a personal level, expect for Sonnen to remain on his best behavior to keep “The Count” on an even keel. “UFC on FOX” takes place Saturday inside United Center in Chicago, Illinois.